As the actual game part is unchanged, I thought I’d recycle Greg Schloesser’s review from five years ago. One, he does a wonderful job of describing the game. 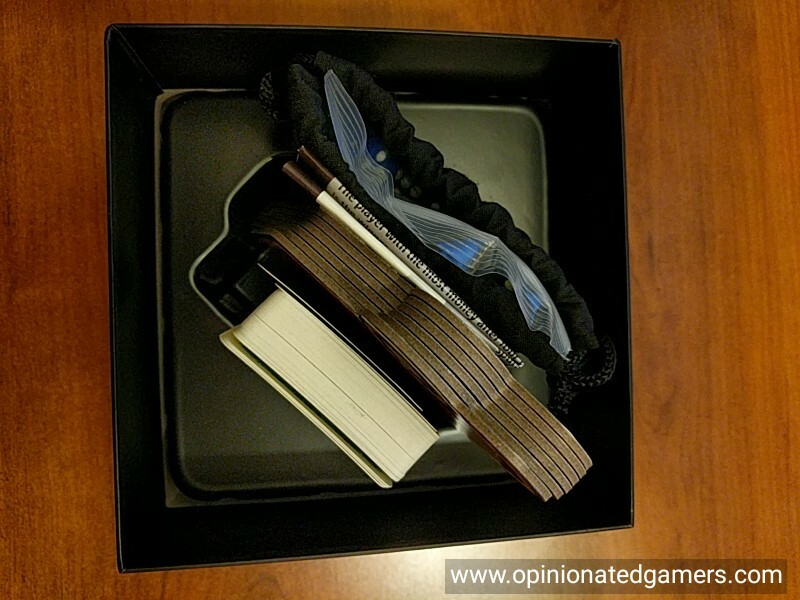 Second, it’s always interesting to go back and read what our reviewers thought of a game in its initial review, and how those opinions have changed over time… So, without further ado – here is Greg’s review! Dice have been with us since before recorded history. The oldest dice discovered thus far were excavated in Iran and date back a staggering five thousand years. The dice apparently belonged to an ancient Backgammon set, a game that is still immensely popular throughout the world. Dice continue to be used in games of chance to this very day. It seems there is no end to creative uses for this simplest of items. As a board game enthusiast, I am continually amazed at the creativity of designers. Not only can they devise highly original mechanisms, but they can put unique and creative twists on old mechanisms and find new and exciting ways to utilize familiar components. 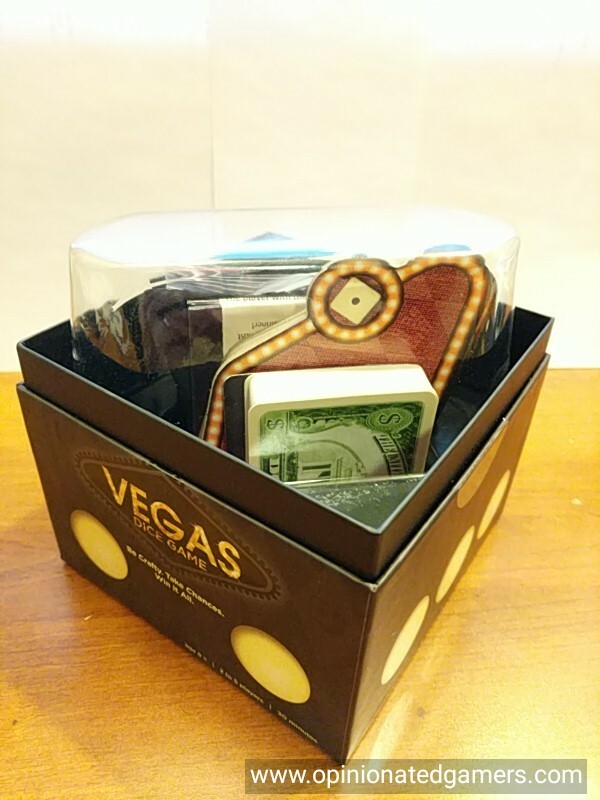 Designer Rüdiger Dorn has taken fistfuls of dice and created a unique and fun betting game themed around the dice capital of the United States: Las Vegas. 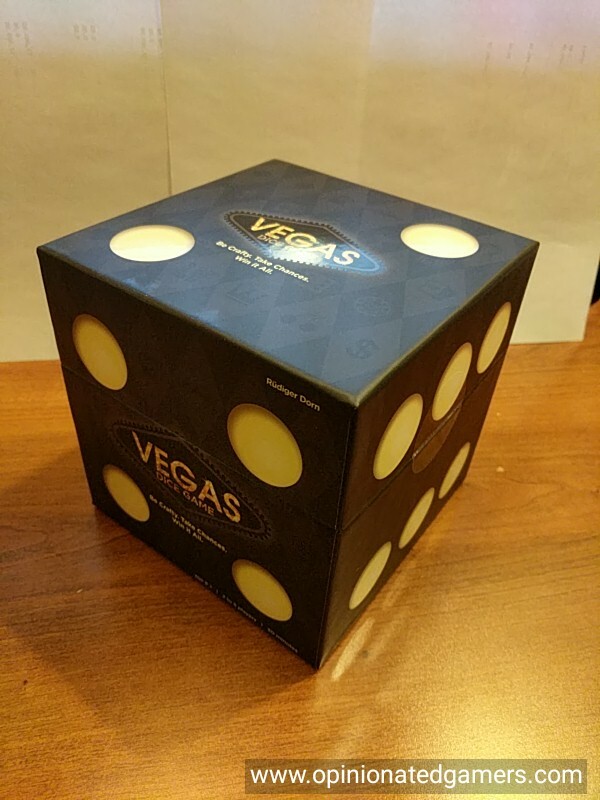 Published by Alea / Ravensburger, Vegas is a light but extremely fun dice rolling game wherein players are attempting to win large payouts from six Las Vegas casinos. 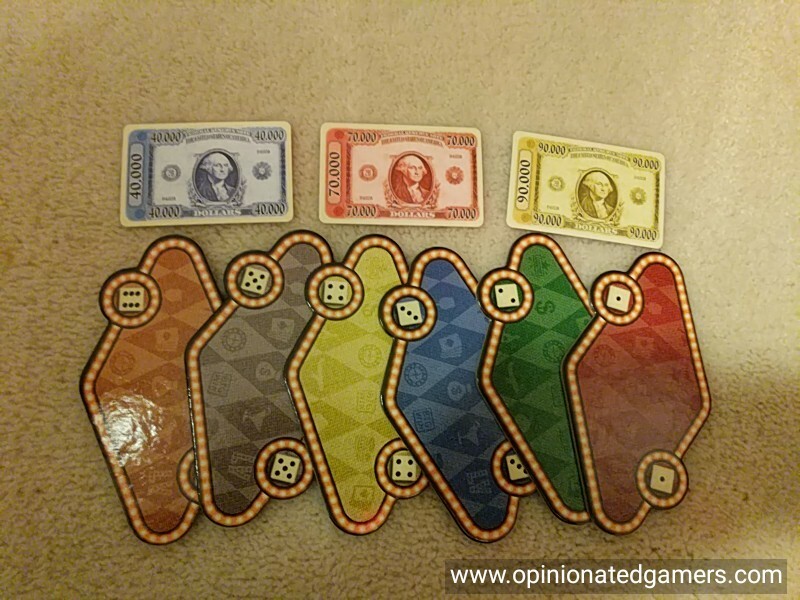 It is part of the “small box” Alea line, and includes an abundance of dice in five different colors, six cardboard placards representing the casinos, and a stack of currency cards. The six casino placards, numbered one-to-six, are placed in a row on the table. Currency cards are revealed until each casino has at least $50,000 available. Banknotes range in value from $10,000 to $90,000, so there can be quite a disparity present at the casinos. Players each receive eight dice in their chosen color and the gambling excitement begins! A player’s turn is quite simple: roll the dice and assign dice to one of the casinos. Once a player rolls the dice, he must choose one number and place ALL of the dice displaying that number on the matching casino. For example, Gail rolls all eight of her dice, resulting in 3, 3, 3, 2, 2, 4, 5 and 6. She opts to take the two “2s” and places them on Caesar’s Palace, which is the #2 casino. She now has six dice remaining for her next turn. Once dice are placed on a casino, they are locked and cannot be re-rolled. Each player performs the same action, rolling and placing dice, until players have placed all of their dice. At that point, each casino is examined to determine the player or players who have the most dice (number of dice, not the value) present. If any players have the SAME numbers of dice, their dice are removed and they will not receive any banknotes. This “tied players lose” mechanism is deliciously evil! The player with the most dice remaining takes the most valuable banknote present at that casino. Any remaining banknotes are distributed to the remaining players in order of descending number of dice. Currency is distributed from each of the six casinos in this fashion, after which any undistributed currency is discarded in preparation for the next round. Each of the three rounds is conducted in the same fashion, after which players tally their collection of banknotes to determine the wealthiest player, “King of Vegas” and winner of the game. The game generally takes about 30 – 40 minutes to play to completion. Sometimes a player will roll an abundance of a particular number, but placing them all would leave the player with few or no dice for remaining rounds, which is usually an undesirable predicament. Alternatively, the player may not want to compete at the casino where he would be forced to place these dice. So, it is often a wiser move to select a number that appears on fewer dice in order to compete at a more desirable casino and/or preserve dice for future rounds. Of course, this is a dice game, so luck is prevalent, if not dominant. Often a player is forced to place dice at casinos where he does not wish to compete or does not even have a chance of capturing cash. It can also be frustrating – albeit in a fun sort of way – to be forced to place dice on a casino that forces a tie, thereby denying the player any payout from that casino! No one ever claimed that dice are fair! As I mentioned near the opening of this review, Vegas is light, yet extremely fun. There is excitement over competing for the most valuable banknotes, and devious fun in trying to best your opponents and leave them penniless. As with many dice games, you often vocally hope to roll a certain number, cheering when you succeed and moaning when you fail. There can also a considerable amount of posturing and blustering – all in good fun, of course – hoping to warn opponents away from certain casinos, or cajole them into placing dice at particular establishments. While much of one’s fate is determined by lady luck, there are enough decisions to elevate the game beyond a mere casting of lots. While the real Las Vegas holds little or no attraction for me, I find the seductions of this Vegas quite irresistible! Ted C.: Greg is pretty much on target here. Very light filler. If played quickly, it can be a nice diversion. If not, it can be painful. Joe Huber (played once): I think Greg’s last sentence gets to the heart of what prevents Vegas from being a winner for me. For various reasons, I am strongly biased against institutionalized gambling; as a result, Las Vegas is not a place I care to be, if I can avoid it. And the choice of the Las Vegas theme causes what would be an acceptable game for me – though I didn’t find it nearly as enjoyable for the mechanisms as Greg did – to be one that I don’t much care for. Yes, it’s an abstract game, and the theme is just tacked on – but that doesn’t mean that the theme isn’t theme, or that you aren’t spending the game looking at pictures of casinos. I don’t find it offensive, in any way – just distracting, leaving my opinion on the low end of neutral. Dan Blum: I agree with Greg in general, although I am not as enthusiastic about it as he is. While it works with five players, I think it’s better with fewer, as not only is there less downtime, but you can use the neutral dice variant in the rules, which makes things more interesting. Nathan Beeler: Dice hate me. Which is ok, because the feeling is mutual. It usually takes an extraordinary design to overcome my immediate reaction to a game using dice as a part of its central mechanism. Either that, or the game has to be correspondingly lightweight enough that I don’t care that my decisions are dependent upon the outcome of dice rolls. Vegas is certainly lightweight, as others have pointed out, which brings it back into the realm of games I could like. All that is to say, dice and a lack of control aren’t the reason I didn’t care for this dice game. And I love Las Vegas the city, so that wasn’t a factor. The game play just didn’t grab my imagination in any way. Things just sort of happened. People rolled dice and either got the dice that gave them an obvious decision or they had to do something they didn’t want to do. Very often people chose to play a single die to a number they had no hope of winning in order to preserve their other dice for a chance to roll what they really wanted next time. But even that was fairly obvious and not exciting. The game for me lacked any drama: roll the dice and check to see if you got something good. It had none of the big reveal of a game like Liar’s Dice or the sweat inducing press your luck anxiety of something like Can’t Stop. The game played, and then it ended and then we played a better one. Dale Yu: I like it as a light filler – there are a few decisions to be made each turn, and the last roll of your turn can be a bit stressful as sometimes you hope not to roll a certain number as you have to place ALL of a particular number. It’s a good introductory game for non-gamers or a filler at a game night. I have only played it twice, once with 4p and once with 5p, and it worked just fine. It was just right at 20-30 minutes, anything longer and I’d probably not like Vegas as much. Craig Massey: This should have been the SdJ winner over Kingdom Builder and I say that as a fan of the latter. It plays quickly and is extremely accessible for the general family. Add the neutral dice variant and you have something more for the hardened game player. While it does not set the world on fire with new innovative mechanics, I don’t think the game ever intended to do that. OK, so what’s different in the new version? As far as I can tell, only cosmetic changes. First, the box is different. The new version comes in a 5.25 inch cube which will totally stack nicely with all your other games of this particular size/shape in your game collection. OK, I’m saying this somewhat in jest. It sure looks nice, and will likely attract the eye of Joe American shopping in Target – but this really riles up my OCD-ness because I like my games neatly stacked by matching box size on the shelves. Within the box, you’ll find a plastic form which lies over the components to help keep the box shape and to keep the components from moving around. As with the other forms of the game, the actual volume of components is small. All of the bits fit within a 5” high by 1.5” wide slot in the box insert. But – the sharp looking cube will definitely catch the eye as you walk by the shelves. The other noticeable change is the casino tables. Unlike the previous versions of the game which depicted casinos (whether real or imaginary) on the six cardboard cutouts, the current version has simple solid colored tables for the dice to rest upon. The money is still the same, with the multicolored George Washington faces looking at you on all the bills. But, other than the form factor, it’s the same old game that many of you will be very familiar with. So how has the game held up over time? I was fairly favorable in 2012 with this game, and Vegas has since made its way onto my all-time favorite list of games. It’s one of the games that I keep around at home, in my travel kit and at the lake house because it’s so accessible to gamers of all levels of experience, and it’s a ton of fun. With casual gamers, I’m more than happy to play with the basic rules, though I do prefer the neutral dice variant with seasoned gamers. For what it’s worth, the neutral die variant is actually included in the rules of this version – even if it targeted for the American mass market. As Craig noted well five years ago, this seems like it would have been a more suitable SdJ winner. It certainly has received the most play of the three nominees (Kingdom Builder and Eselsbrücke are the other two) and has an all-time reserved spot in my game collection. Alan How: Still an excellent filler or end of evening game for me. I play with the expansion rules with gamers. Dan Blum: I haven’t played it much recently but I would if asked and I wouldn’t mind keeping it around as a light option if not for the price, which was always kind of high. This version will presumably be cheaper but I really hate that box, so I will probably continue to not own it and play it very rarely.